I came across this humourous puzzle when browsing through some old chess magazines. The solution involves some unique moves and is quite easy when you see the idea. Happy solving! FIDE has now split what used to be called the World Youth Championships into the World Cadets (under 8, 10 & 12), World Youth (under 14, 16 & 18) and World Junior (under 20). This year the World Cadet Chess Championships were held in Santiago de Compostela, Spain, from 3rd to 15th of November 2018. Club member Keniesha Govender was picked for the South African under 12 girls team and scored 2½ points in the tournament, for more details click here. The Third Swiss was contested over 6 rounds from 11th October to 15th November. Ntando Zwakala and Henry Oliver were joint winners on 5½ points, after they drew their game in round 4 and beat their other opponents. See here for detailed results. The Mhlongo Memorial blitz tournament held on 4th October was won by Sizwe Ndlovu, ahead of Henry Oliver and Johannes du Preez. See here for detailed results. The final round of the John Blackburn Memorial on 27th September saw the two leaders on 5/6 battle it out for 1st place. A close contest was won by Sibonelo Duma, the leading player from DUT, who ended on 6 points from 7 games, gaining a massive 83 rating points in the process. See here for detailed results. I am shocked to report that Paul Curry passed away on 17th September 2018. A memorial service was held for him on Saturday 22nd at the Gateway Church in Mount Edgecombe. We played many doubles games together! 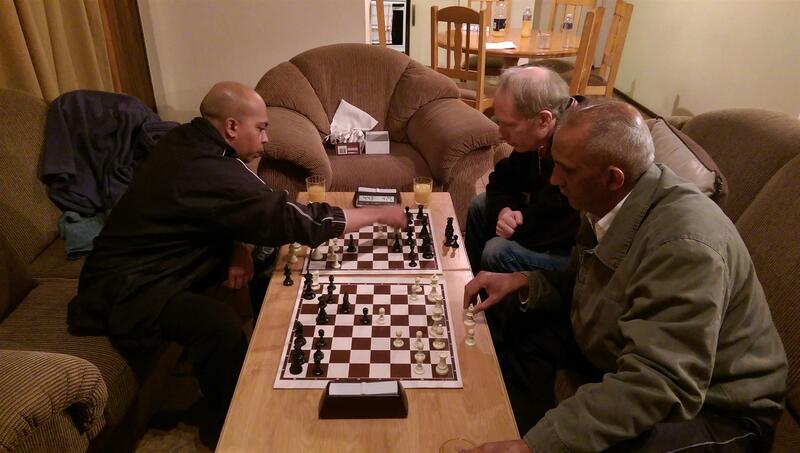 I have fond memories of chess nights at Paul's house in Umhlanga (eg. this video) and on our hiking trips in the Drakensberg. He loved playing chess so much that he even played blindfold chess against Desmond whilst hiking. Paul was well liked by all at the club and we will sorely miss him. We celebrated our 125th birthday on 16th August 2018 with a selection of delicious cup cakes, and a lucky draw puzzle competition. For those who like solving puzzles, here is the page of (mate in 2) puzzles. The club completed a rated rapid tournament over 4 weeks in June/July, with 2 rapid games played per week. I took a break to have a hernia repair operation, so Nadean was chief arbiter in my absence. New member Ntando Zwakala won all his games, with Jerry Zuma taking 2nd place. Here are the detailed results. On 7th June Keith Rust gave the traditional simultaneous exhibition by the new club champion. Seven club members accepted the challenge, which ended in 5 wins for the champ, a draw against Duncan Podmore and a win by John Khan. John was also successful in last year's exhibition against Desmond! The club's annual championships started on 15th March and were completed on 30th May 2018. There were 3 round-robin sections and a Swiss section this year. Keith Rust is club champion for a record 25th time, and these are the detailed results of section A. The B section was marred by the withdrawal of 3 players. The remaining 7 players had a great contest. 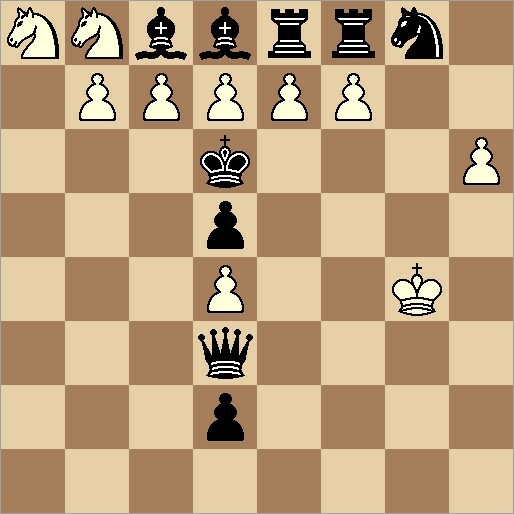 In the last game to finish Cedric Nzama faced Leon Scharnick with the White pieces. Cedric reached the ending of Knight and 3 pawns versus Bishop and 1 pawn, but somehow Leon escaped with a miracle draw, as his Bishop stopped all of Cedric's pawns! So honours were shared between them, and here are the detailed results of section B. The winner of section C is John Khan, with 3 players tied for 2nd place just ½ point behind him. At one point, it was possible for 5 people to win this section, but a strong finish by Charlotte Millard saw her secure 2nd place on tiebreak. Michael Zulu won section D with a full house, 9 out of 9. 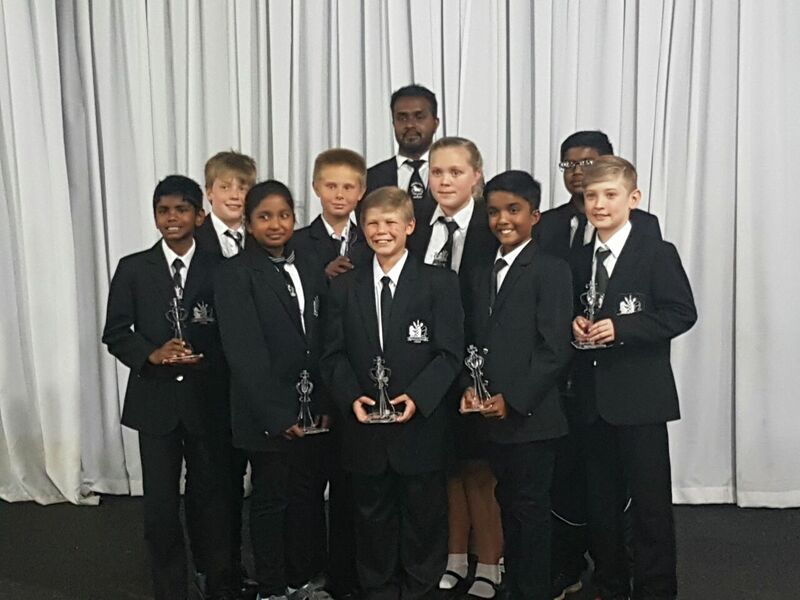 The SA Junior Closed Chess Championships of 2018 were held recently in Benoni. Each age group section was an 11 round Swiss, with only the top juniors in SA competing. We congratulate the following members for being selected to play in this event - Chad Millard (u16), Charlotte Millard (u12), Thacian Reddy (u12), Lesharn Govender (u12), Keniesha Govender (u12), Kaedan Govender (u10) and Jorah Soojay (u10). Special kudos go to Kaedan Govender for his 1st place in the under 10 open section. PS. Kaedan has now appeared on SABC news! Members are asked to complete the club membership form for 2018 and pay any subscriptions before entering the championships. The March blitz tournament was won by Henry Oliver with 5/5. Here are the blitz results and I'm told that Cedric Nzama won the playoff for 2nd place. The club's first tournament of the 2018 year was won by Bongani Mgaga after he defeated co-leader Chad Millard in the last round. Here are the final results. Here is a link to a superb report about Nakamura's visit, which was published on the chess.com website.